Cadbury is one of the world's most iconic chocolate and confectionary brands - the second largest chocolate brand on the planet (second to Wrigley's). Such a high reputation is well deserved, since Cadbury make some of the most popular chocolates on the shelves, and have done since Cadbury was established in 1824. Since then, there have been a lot of changes, but their delivery of glorious chocolates continues. The mammoth multinational corporation that we know today as Cadbury was established in Birmingham, UK, by John Cadbury, who sold coffee, tea, and drinking chocolate. From humble beginning selling a few products in the street, Cadbury moved into a manufacturing factory in 1931. Back then, the high price of manufacturing meant that the variety of cocoa and drinking chocolates being made by Cadbury were mostly sold to wealthy customers. John Cadbury and his brother Benjamin became business partners and continued to expand Cadbury, to the point that, in 1854, Cadbury received a Royal Warrant to become manufacturers of chocolate and cocoa for Queen Victoria. Cadbury was then taken over by John Cabury's sons, Richard and George, in 1861. The brothers rapidly returned Cadbury's focus to improving the quality of their confections. The first major step in this occurred when the brothers brought a new manufacturing technique to the UK from the Netherlands which was able to remove greater proportions of unpalatable cocoa butter from cocoa beans. Cadbury then began exporting chocolate confectionaries in the 1880s. Cadbury continued to expand, developing new products and improving existing products. 1905 saw the launch of Cadbury's heralded Dairy Milk bar. Dairy Milk, developed by George Cadbury Jr, represented a huge success for Cadbury and was the first time a British company had successfully mass-produced milk chocolate. 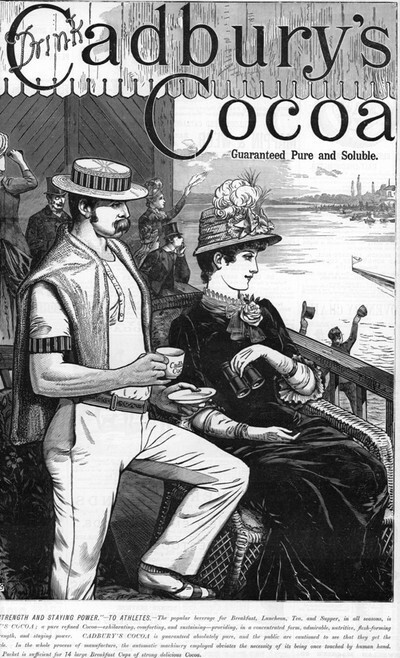 1906 then saw the launch of a stronger Bournville Cocoa line. This, paired with the Dairy Milk chocolate bar, formed the base of Cadbury's rapid pre-war expansion. Dairy Milk Fruit and Nut was then introduced in 1928, followed by Whole Nut in 1933, alongside Flake in 1920, Cream-filled eggs in 1923, Crunchie in 1929, and Roses in 1938. By the mid-1930s, Cadbury has ceased to be a luxury brand and was finally affordable to most of the population. Cadbury developed its first overseas production line in 1918, when they opened a factory in Tasmania. 1919 saw Cadbury merge with J. S. Fry & Sons, one of their British competitors - this is where Cadbury acquired Fry's Turkish Delight (among other brands)! During World War II, parts of Cadbury's Bournville factories were put to work manufacturing goods for the armed services and war efforts. The factories returned to chocolate production following 1950, when rationing of chocolate ceased. Cadbury later acquired MacRobertson's, an Australian confectioner, in 1967 to take a 60% market share of chocolate confections in Australia. Cadbury then merged with Schweppes in 1969, but demerged in 2008. In 2008, Cadbury attempted to swap some of the cocoa butter in non-UK brands with palm oil in efforts to improve the texture and taste, however public outcry resulted in a return to cocoa butter blends in New Zealand and a commitment to use Fair Trade cocoa beans. Cadbury was purchased by Kraft Foods in 2010, but still continue to produce delicious, high quality, affordable chocolates and confections.